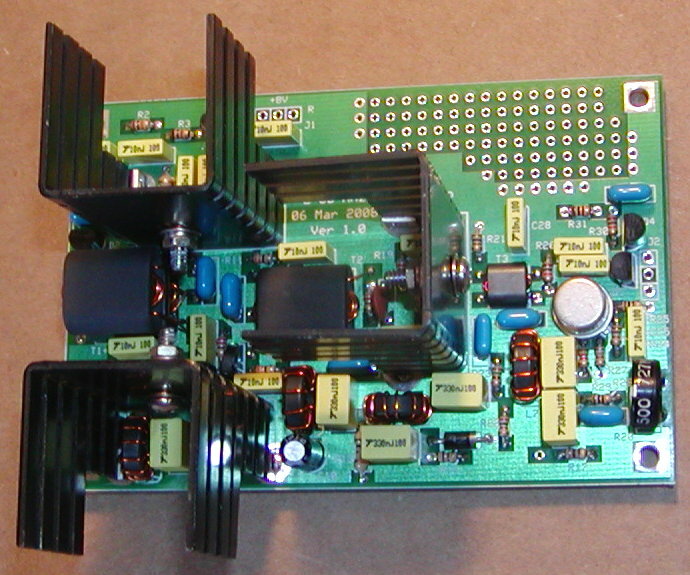 Diode Ring mixer via a 6 dB loss band pass filter. 2. 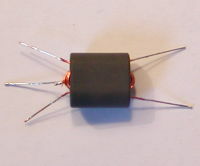 Install all 1/4 Watt Resistors. 4. Wind and Install all Chokes and Transformers. leaving a one inch loop. Wind each wire 2 and 1/2 turns times more through the binocular. Strip the insulation off the two right wires using sidecutters or sandpaper. and form L1 per the picture. Align and Install L1 on the PCB into the holes per the picture. Cut 10 inches of 26 GA wire. 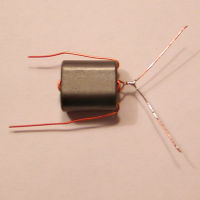 Fold the wire in half and insert into both holes of T1. Wind each wire 2 full turns more through the binocular. 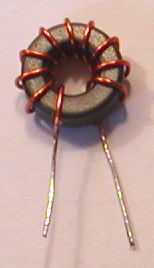 Temporarily, twist the two wires together so that winding the second layer will be easier. Cut 15 inches of 26 GA wire. Fold the wire in half and insert into both holes of T1 from the right side. Wind each wire 3 full turns more through the binocular. Unwind and trim the wires on the 5 turn winding (right side) to 1.5 inches. Strip the insulation off the two right wires using sidecutters or sandpaper and tin. Trim the wires of T1 on the 7 turn winding (left side) to 2.0 inches. Strip the insulation off the two left wires using sidecutters or sandpaper and tin. Align and Install T1 on top of L1 on the PCB. leaving a one inch loop. Wind each wire 1 and 1/2 turns times more through the binocular. Strip the insulation off the two left wires using sidecutters or sandpaper. and form T2 per the picture. Cut 15 inches of 26 GA wire. 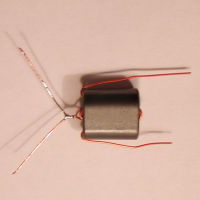 Fold the wire in half and insert into both holes of T2 from the left side. Wind each wire 3 full turns more through the binocular. Trim to 2 inches. Align and Install T2 on the PCB into the holes per the picture. 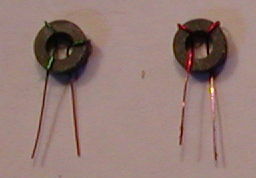 ____L3 and L4: cut two inches off of the 10 inch piece of twisted 30 GA red/green wire. Repeat for L4. Strip the insulation using sidecutters or sandpaper and tin. DO NOT INSTALL AT THIS TIME. Locate the red 30 GA wire. 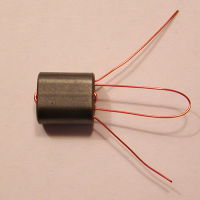 Fold the wire in half and insert into both holes of T3. Wind each wire another 2 and a 1/2 turn through the binocular. Locate the green 30 GA wire. 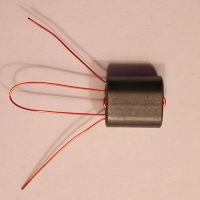 Fold the wire in half and insert into both holes of T3 from the left side. Wind each wire 1/2 turn more through the binocular. Unwind and trim the wires on the 6 turn winding (right side) to a half inch. Trim the wires of T3 on the 2 turn winding (left side) to a half inch. Align and Install T3 on the PCB. 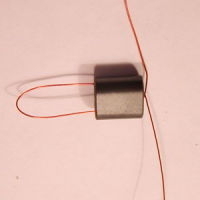 ____L2,5,6,7: Wind 10 turns of 26 GA wire on an FT37-43 ferrite toroid. Cut 8 inches of 26 GA wire. Wind the wire on the toroid clockwise. 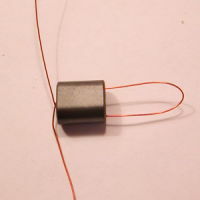 Trim the wires of L2 to a half inch. Strip the insulation off the wires using sidecutters or sandpaper and tin. DO NOT INSTALL THE CHOKES AT THIS TIME. Straighten blue 100n capacitor's leads before installing. 8. Install all Transistors WITH Heat Sinks. 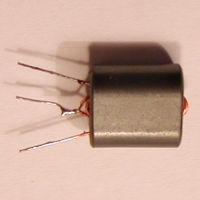 ____Q2: 2SC5739 - Mount the transistor per parts markings on the PCB. 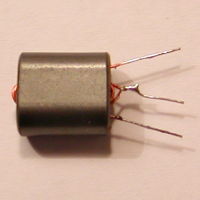 The transistor is mounted on the inside of the heat sink. Use Heat Sink Grease between the Transistor and the heat sink. 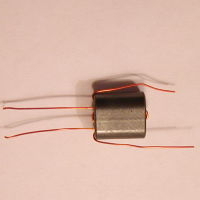 Use a 4-40 scew and nut to secure the transistor to the heat sink. 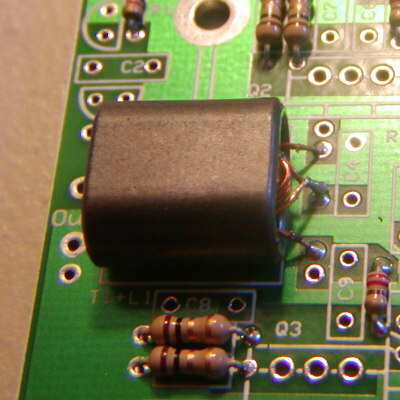 ____Q3: 2SC5739 - Mount the transistor per parts markings on the PCB. The transistor is mounted on the outside of the heat sink. 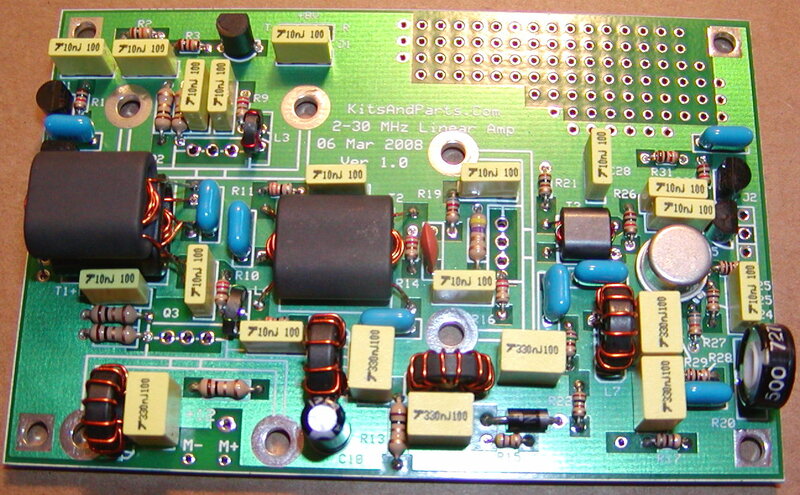 ____Q4: 2SC5739 - Mount the transistor per parts markings on the PCB. 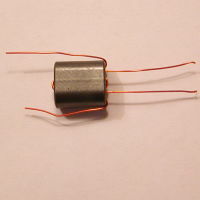 ____R17: This resistor can optionally be 1/4 watt for higher heat dissipation. 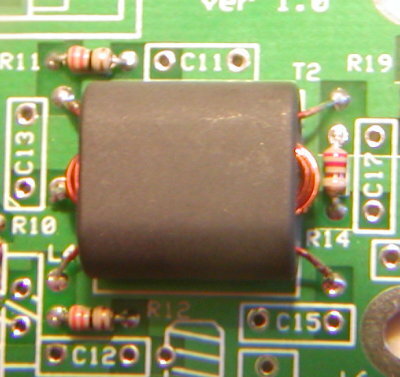 Note the extra PCB mounting hole between R15 and R17. For experimentor wanting to try different RF final amps. ____M1 % M+: These pads are available for measuring the BIAS currents of Q2 plus Q3. 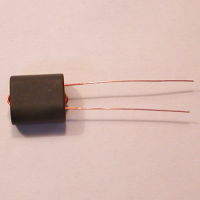 50 milliamps per transistor or 100 milliamps total. 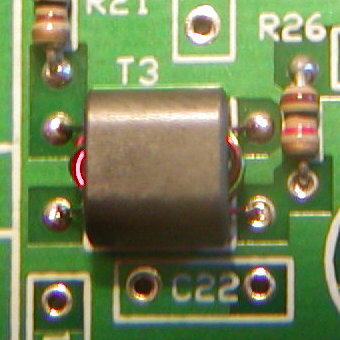 Adjust R20 (500 ohm pot) for desired bias current. 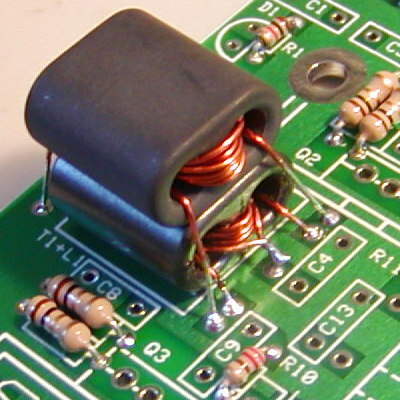 ____J2 pin 2: The input of the Amp needs to be at DC ground for the PIN diodes D4,5 to function. XMIT and RCVE control signals at an 8 volt level. When not active, the control signal levels should be at ZERO volts/ground.